UPLAND >> He dances, he hops, he calls out for a mate. But he’s not likely to find one. 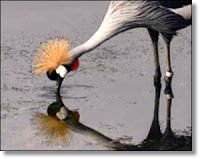 He — or perhaps she, we really don’t know — is an East African crowned crane, also known as a grey crowned crane. As the name suggests, it’s clearly not native to Rancho Cucamonga. But according to locals, amateur photographers and bird enthusiasts, this handsome fellow has made a home in Cucamonga Basin No. 6, a flood control and groundwater recharge area south of the Colonies Crossroads shopping center near the 210 Freeway. Calls to both the Los Angeles and San Diego zoos indicated they’re not short a crane. But the tag on the left leg indicates he belonged to someone. Alta Loma resident Suzanne Stull spotted the bird Monday morning. “I like to take bird and wildlife photos and hiked around the basin, hoping to find something interesting,” she said in an email. The bird was so interesting, she had to take to the internet to dig up information.